It is midweek, my quiet morning as I go to work in the afternoon. I putter around doing a bit of this and a little of that, feeling time pass at a different pace than on other days. I hope to get a bit of work done on my painting, I only gets about an hour of straight painting time a week, something I hope to remedy. I also hope to get out in the woods for a bit before lunch, I have a trail just up the street that I hope I can access now that the banks are receding. Right now though I am enjoying a cup of tea before donning boots or picking up a brush. I can choose either to go first, much like the stairs above give the option of going up or down. But not both, choices must be made and things arranged around the decisions. If you couldn’t guess these stairs are ones at the studio that I climb on my many indoor day walks. I can’t imagine how many feet have traveled up and down on these treads, might it be over a million? Maybe more? It does make one pause to think about all those people that used these stairs, the lives they lived, the thoughts they had. That is what I love about old buildings, the stories that have have seeped into the structure and become part of it. 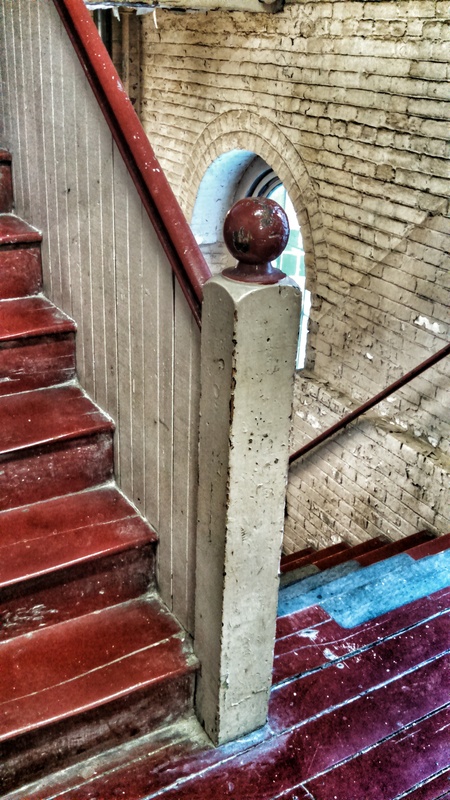 This entry was posted in Photographic Musings and tagged mills, old buildings by rkb665. Bookmark the permalink.